Fetid Jofnhild is a Nord beggar who sleeps in a bedroll west of Bruma's north gate. His routine starts every day at 6am with a walk to the east gate to beg for food and money. At 10am he will move to the alley behind the Mages Guild and the Fighters Guild to beg for four hours. He heads back to his bedroll at 2pm and strolls around the area until 6pm, when he begins his two-hour-long dinner, provided that there's a piece of food in the sack near his bedroll. After he has had his only meal of the day he will continue wandering in the general area until his bedtime at 10pm. His possessions include only his patched vest, coarse linens, and any gold he may have earned during the day. He doesn't have access to weapons or spells, relying solely on his fists during combat. You can catch the disease rattles from him, should you fight with him. 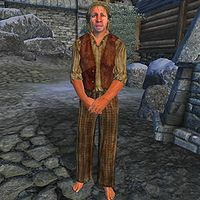 He, along with the other beggars around Cyrodiil, can give you hints in case you want to join the Thieves Guild and he is one of the poor and suffering you need to help before you can receive Speechcraft Training. For a small fee, he will also prove useful during the quest Spies, as he will provide information about Jearl and her new resident.